First and Foremost: Safety. Our leaders and instructors undergo thorough and rigorous training in each activity. Additionally, all equipment and courses are regularly inspected and maintained above industry standards. Every activity is designed to challenge each participant, to develop confidence when faced with new challenges, and to grow within their comfort zone. We are a "Challenge by Choice" organization. That means we train our leaders and instructors to provide a safe and encouraging atmosphere for every participant. Each activity is instructed from the most basic level and tailored to the enthusiasm and abilities of the individuals and group as a whole. No one is forced to do anything they don't want to do, but we always find a little encouragement can help! We're here to bring people together. To provide the best experience for each individual and to provide ample staffing, equipment, and time, the maximum size for a group is 12 on the trail* and 14 for the lodge-based Group Program. Staff to Participant Ratios fluctuate with the group size and the activity. For many high-adventure activities, the ratio is decreased by adding extra staff! Don’t have a mountain bike or climbing harness? No worries! 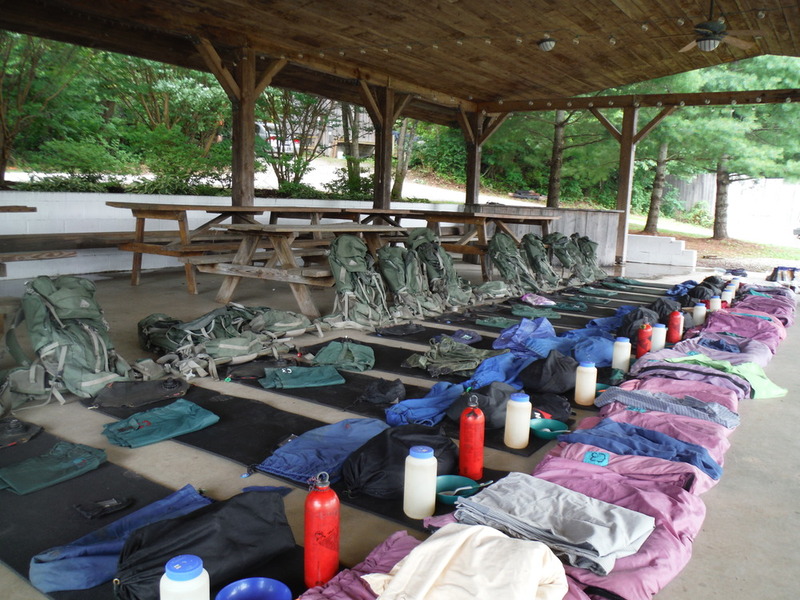 We provide all the equipment needed, from tents to sleeping bags and backpacks to bikes, we have you covered. 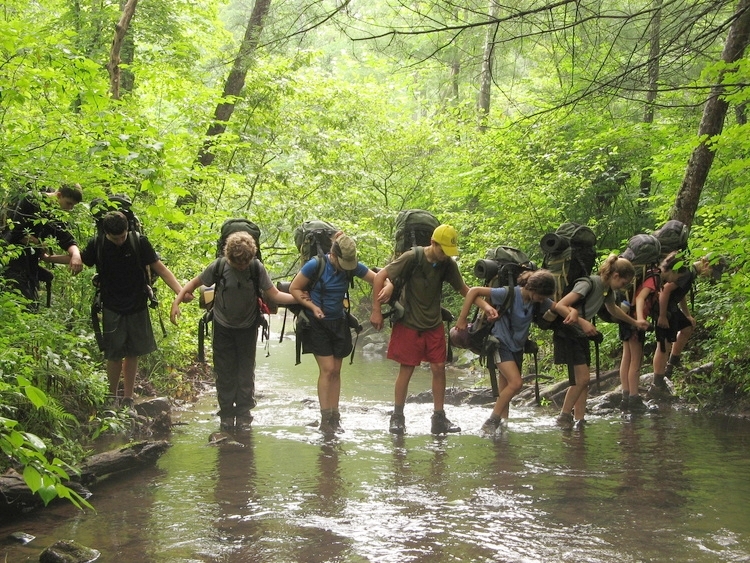 For Groups with our retreat program, we encourage you to embrace the weather - a rainy trip down the creek or hiking in the heat of hot day can be challenging, but it can also be an amazing opportunity for growth, bonding, and some fun stories to share later. You're the boss, though - If the weather worries you, we'll be happy to adjust and discuss other options while waiting it out! Classic team-building challenges on one of our two courses, these problem-solving games are designed to challenge your group to work together to accomplish a set goal. The heart and soul of our adventure program; take your group on a multi-day, guided hike through the spectacular Blue Ridge Mountains. Each trip can be customized to your group’s physical needs and time constraints to provide an unforgettable experience. Four plastic 50-gallon barrels, two sheets of plywood, four 2x4’s, and some rope. Can your group work together to construct a raft to float across our pond? From leisurely floats down our local creek to multi-day canoe camping trips on the New or James Rivers, grab a paddle and explore our local waterways for a fun, scenic activity for all ages. Challenge yourself on our high ropes course as you traverse and climb one of our several elements while 30-50 ft above the ground! Scale our 50-ft climbing-gym styled wall while learning the fundamentals of rock climbing. Once at the top, challenge yourself to rappel the 50-ft back down to the ground. Develop some basic outdoor savviness, from fire-by-friction, shelter building, edible plant identification, and so much more, as you and your group learn to how to live like a true mountain man. Learn the seven principles of Leave No Trace and how to apply them when outdoors so as to learn fundamental outdoor ethics and gain a sense of stewardship for the outdoors. 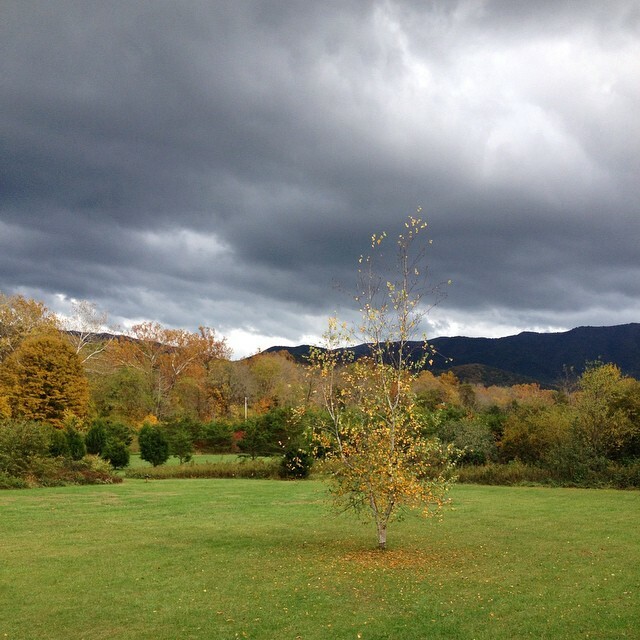 Take a single or half day hike with one of our qualified staff members and explore the Blue Ridge Mountains. Be it hiking on the Appalachian Trail or to our scenic Bluff overlook, regardless of your group’s physical ability, we have a hike for you. 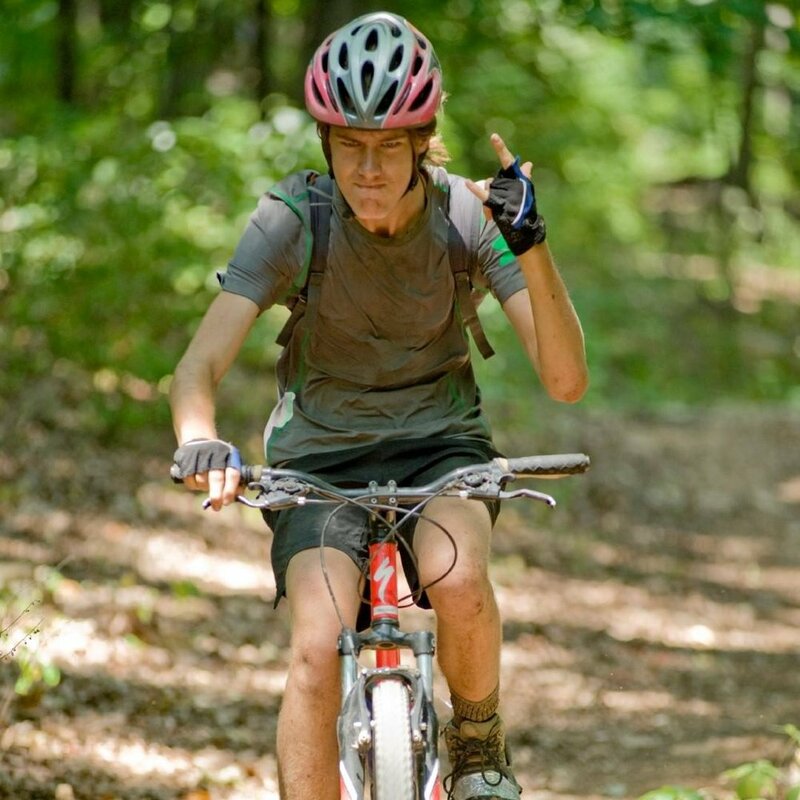 From riding along easy jeep roads to technical singletrack trails, our mountain biking program has a trip for any skill level. Each ride will start by covering the basic skills of mountain biking just to make sure everyone in the group feels prepared to take their biking skills off-road. Learn the basics in our pond or take your skills to the river as you run whitewater rapids in your own boat. Whichever skill level your group is at, we have the whitewater river trip for you!